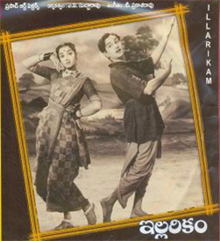 Illarikam is a 1959 Telugu film directed by T. Prakash Rao and starring A N R and Jamuna. It is a Silver Jubilee film produced by Anumolu Venkata Subba Rao of Prasad Art Pictures. The songs are very popular, particularly BhalE chance-lE describes the virtures of the Telugu tradition Illarikam. It was remade into Hindi by L. V. Prasad as Sasural in 1961.